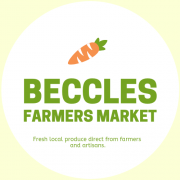 Beccles Farmers Market – "Bringing you fresh local produce at affordable prices"
Tomorrows market will be packed with local produce just in time to re-stock for the rest of the bank holiday weekend - with the sun making an appearance its the perfect time to get the BBQ out and enjoy the bountiful British treats on offer in Spring! See you there from 9am - 1pm! Tomorrow we are welcoming the Burroughs as our new free-range egg farmers, replacing the Kingery's who have retired after been with us for 19 years. We will also be cooking up a storm in advance of Great British Beef Week which is coming up at the end of this month as well as welcoming our first Strawberries of the season! Our 19th Anniversary market will be joined for the first time by the new 'Fabulous Fungi' as we sadly say farewell to one of our most dedicated and long serving producers - Bob and Helen from Kingery's Eggs. Posted byhundredriver February 15, 2019 February 15, 2019 Posted inUncategorizedLeave a comment on Beccles Farmers Market Tomorrow! We’re back with a special thank you! We're back this weekend and would like to say a HUGE thank you to all of our customers who support us throughout the year, especially when its cold and miserable by giving you a FREE farmhouse breakfast for every customer that spends £5 at the market. Posted byhundredriver January 14, 2019 Posted inUncategorizedLeave a comment on We’re back with a special thank you!